To follow up on Ami’s post this morning on Elizabeth Anne Designs about her favorite trends for weddings in 2010, I wanted to share a few of my favorite picks for wedding details this year. Ami and I got talking earlier this week about trends we love and things we adore that we’d love to see a lot more of in the coming months and we were inspired to go digging for great ideas to share with you. Hopefully you find an idea you love and want to run with as you plan your wedding. I know Ami and I are already hunting for another excuse to throw a couple of big parties. My first pick…pink wedding dresses! I love the soft lady-like romance I associate with a pretty pink dress and these beautiful gowns are no exception. They are incredibly stylish and really, there is no law that says you have to be wearing some shade of white when you sign your marriage license to make the whole thing legit. I swear. 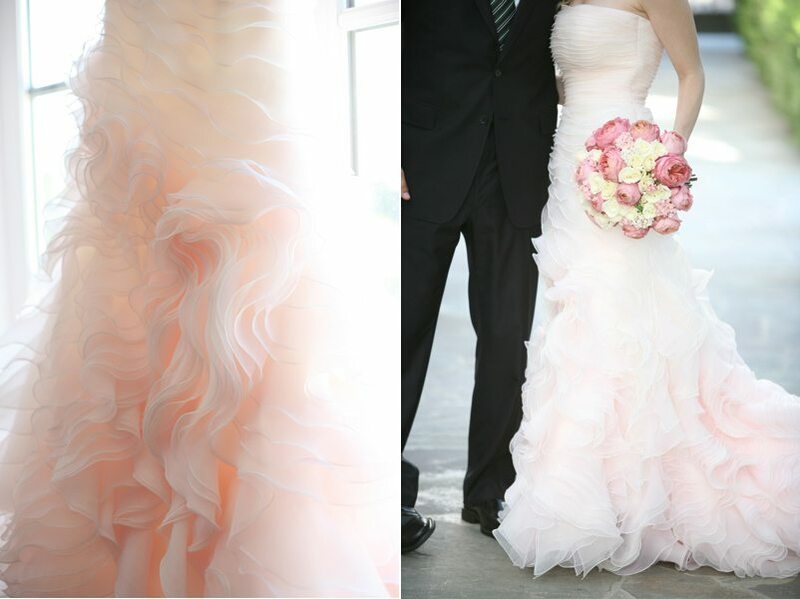 Wondering how exactly to incorporate your favorite pink dress into your wedding celebration? Maddy at The Inspired Bride is just as in love as I am with this pretty pink dress I shared a couple of weeks ago. She designed a gorgeous inspiration board around it that you don’t want to miss. Next up…kites! 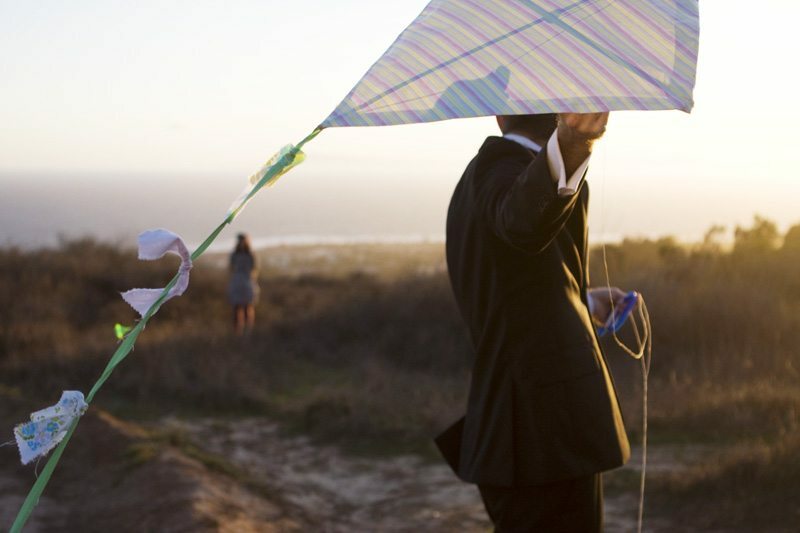 I loved all the photo shoots with big balloons in 2009, but my vote for photo shoot accessory of the year is the kite. It’s just as playful and unexpected and really incredibly charming. Furthermore, who says photo sessions are only for weddings? These photos are from a five year anniversary photo shoot. It’s true. You can have beautiful photos taken of you and your spouse for any old reason at any old time. That in and of itself should be a trend, don’t you think? I’m also loving bridesmaids dressed in soft sophisticated shades of champagne, ivory and cream. Now, I might be biased as the beautiful bridesmaids in the second photo below are my bridesmaids on our wedding day, but I just love how classy champagne looks when paired with a bride wearing any shade of white, ivory or cream. Or pink for that matter. I love bright festive color as much as the next gal, but I just can’t get enough of the classic timeless appeal of a fabulous champagne party dress. If you’re growing a little weary of wedding cupcakes, I’m here to tell you that churros are the wave of the wedding treat future. They are delicious, for one, and really really fun, for two. In fact, I am so obsessed with churros lately it’s bordering on problematic so you can probably expect a lot more churro chatter from me in the coming months. Serve them with rich hot chocolate after dinner in lieu of traditional wedding cake or set up a churro bar later in the evening when guests need to reengerize after all that dancing. Either way, they are sure to please. For 2010 I am also loving ballet-inspired details. Think loads of fluffy tulle and yards of ribbon, the palest shades of pristine pink paired with black, and a refined elegance and romanticism you only find with the ballet. To keep it from becoming too much of a theme, incorporate the elements here and there. A pair of beautiful ballet slippers worn with a tea-length dress with a full skirt of tulle or silk organza. 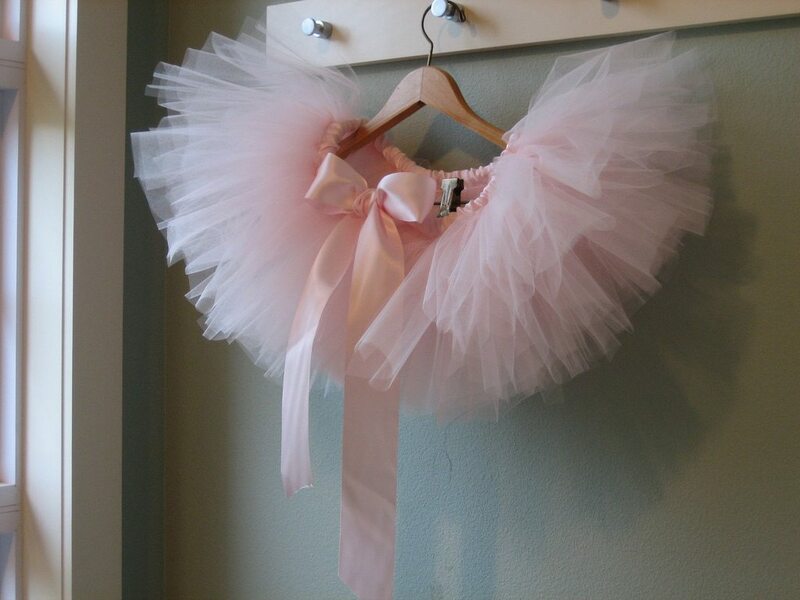 Or maybe a flower girl or two in tutus. Keep the color palette streamlined and pretty and you can’t go wrong. And my last pick of favorite wedding trends for 2010 (or, rather, things I hope become trends in 2010) – eloping. Or small backyard weddings. Or a private wedding on the beach at sunrise so you can spend the whole day celebrating with your new husband/wife. Or a classic at-home celebration with cake and champagne. Or whatever you dream of that might be slightly unusual or unexpected or nontraditional – just do it. Or do what Kathryn’s pushing this year and keep your wedding timeless and intimate and say to hell with reinventing the wheel altogether. I’m an advocate of all of that and I hope to see a lot of it in 2010. Weddings do not require acrobats and fire-breathing dragons to keep the crowds entertained…unless you’re into that kind of thing, in which case I say go for it!